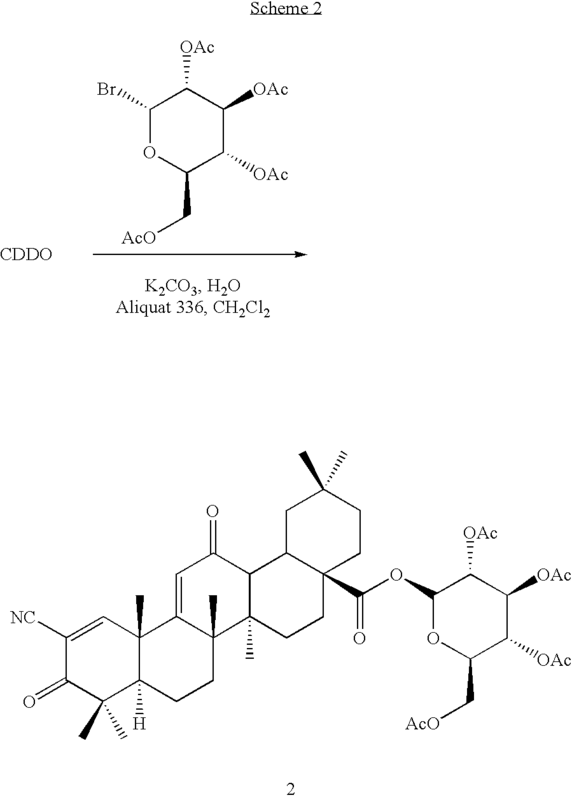 New triterpenoid derivatives with various substituents at the C-17 position of 2-cyano-3,12-dioxooleana-1,9(11)-dien-28-oic acid (CDDO) were synthesized. 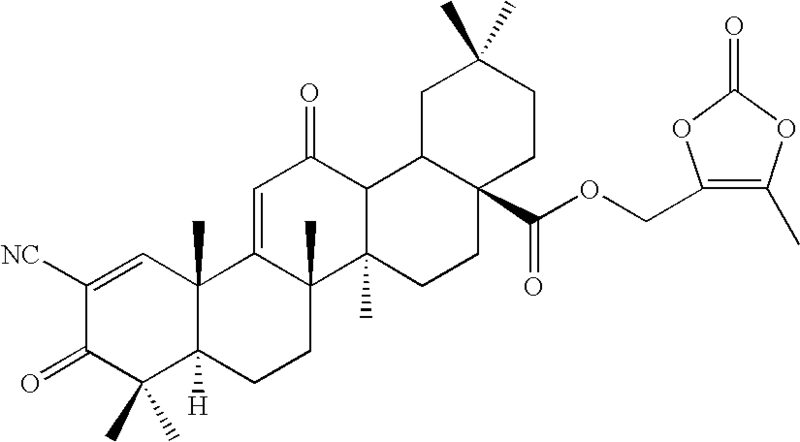 Among them, 2-cyano-3,12-dioxooleana-1,9(11)-dien-28-onitrile (CNDDO), 1-(2-cyano-3,12-dioxooleana-1,9(11)-dien-28-oyl) imidazole, 1-(2-cyano-3,12-dioxooleana-1,9(11)-dien-28-oyl)-2-methylimidazole, 1-(2-cyano-3,12-dioxooleana-1,9(11)-dien-28-oyl)-4-methylimidazole show extremely high inhibitory activity (IC50=0.01-1 pM level) against production of nitric oxide induced by interferon-γ in mouse macrophages. These compounds can be used in the prevention or treatment of diseases such as cancer, Alzheimer's disease, Parkinson's disease, multiple sclerosis, rheumatoid arthritis, and other inflammatory diseases. All the new triterpenoid derivatives are more potent than previously known CDDO. The present application claims the priority of provisional U.S. Serial No. 60/378,009, filed May 13, 2002, the entire contents of which are incorporated herein by reference and without disclaimer. The present invention disclosed herein was made with the support of the U.S. Government under NIH Grant 1R01-CA78814, U.S. Department of Defense Grants DAMD 17-96-1-6163, DAMD 17-98-1-8604, and DAMD 17-99-1-9168. Accordingly, the U.S. Government may have certain rights in this invention. 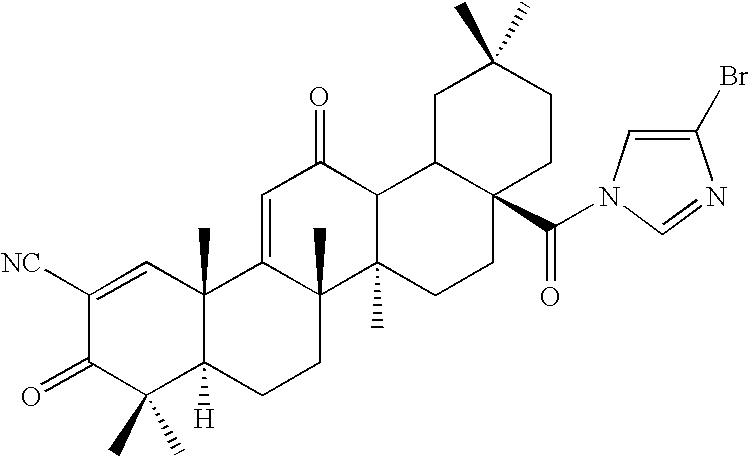 The present inventors have previously reported that 2-cyano-3,12-dioxooleana-1,9(11)-dien-28-oic acid (CDDO) (Table 1), its methyl ester and methyl 2-carboxy-3,12-dioxooleana-1,9(11)-dien-28-oate show high inhibitor activity against production of nitric oxide (NO) induced by interferon-γ in mouse macrophages (IC 50=0.1 nM level) (Honda et al., 1998; Honda et al., 1999; Honda et al., 2000a; Honda et al., 2000b). The inventors also reported that CDDO is a potent, multifunctional agent in various in vitro assays (Suh et al., 1999). For example, CDDO induces monocytic differentiation of human myeloid leukemia cells and adipogenic differentiation of mouse 3T3-L1 fibroblasts. CDDO also inhibits proliferation of many human tumor cell lines, and blocks de novo synthesis of inducible nitric oxide synthase (iNOS) and inducible cyclooxygenase (COX-2) in mouse macrophases. The above potencies have been found at concentrations ranging from 10−6 to 10−9 M in cell culture. 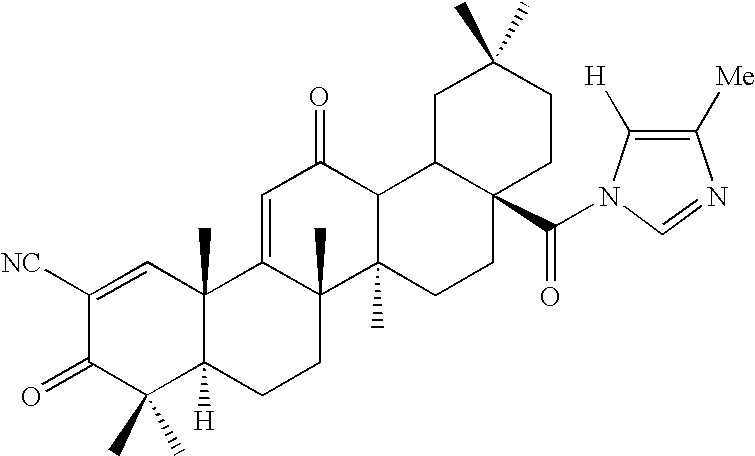 Mechanism studies revealed that CDDO is a ligand for peroxisome proliferator-activated receptor γ (PPARγ) (Wang et al., 2000) and induces apoptosis in human myeloid leukemia cells. As used herein, the term “electron withdrawing moiety” is known in the art, and refers to a group which has a greater electron-withdrawing than hydrogen. A variety of electron-withdrawing groups are known, and include halogens (e.g., fluoro, chloro, bromo, and iodo groups), nitro, cyano, —NR 3 +, —SR2 +, —NH3 +, —SO2R, —SO2Ar, —COOH, —OAr, —COOR, —OR, —COR, —SH, —SR, —OH, —Ar, and —CH═CR2, where Ar is aryl, and R represents any appropriate organic or inorganic moiety and, preferably, alkyl moiety. As used herein, the term “amino” means —NH 2; the term “nitro” means-NO2; the term “halogen” designates —F, —Cl,—Br or —I; the term “thiol” means SH; and the term “hydroxyl” means —OH. Thus, the term “alkylamino” as used herein means an alkyl group, as defined above, having an amino group attached thereto. The term “alkylthio” refers to an alkyl group, as defined above, having a sulfhydryl group attached thereto. 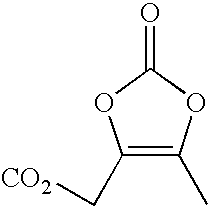 The term “alkylcarboxyl” as used herein means an alkyl group, as defined above, having a carboxyl group attached thereto. The term “amino,” as used herein, refers to an unsubstituted or substituted moiety of the formula —NR aRb, in which Ra and Rb are each independently hydrogen, alkyl, aryl, or heterocyclic, or Ra and Rb, taken together with the nitrogen atom to which they are attached, form a cyclic moiety having from 3 to 8 atoms in the ring. Thus, the term “amino” is intended to include cyclic amino moieties such as piperidinyl or pyrrolidinyl groups, unless otherwise stated. An “amino-substituted amino group” refers to an amino group in which at least one of Ra and Rb, is further substituted with an amino group. As used herein, the term “IC 50” refers to an inhibitory dose which is 50% of the maximum-response obtained. The preferred embodiments of the current invention are 2-cyano-3,12-dioxooleana-1,9(11)-dien-28-onitrile (CNDDO), 1-(2-cyano-3,12-dioxooleana-1,9(11)-dien-28-oyl)imidazole, 1-(2-cyano-3,12-dioxooleana-1,9(11)-dien-28-oyl)-2-methylimidazole, and 1-(2-cyano-3,12-dioxooleana-1,9(11)-dien-28-oyl)-4-methylimidazole all of which show extremely high inhibitory activity (IC 50=0.01-1 pM level) against production of nitric oxide induced by interferon-γ in mouse macrophages. In other preferred embodiments the invention provides D-Glu(OMe)4, L-Ara(OAc)3, and D-Gal(OAc)4. The synthesis, inhibitory activity and structure-activity relationships (SAR) of the aforementioned and other new analogues is described herein. Dietary and nutritional supplements with reported benefits for treatment or prevention of Parkinson's, Alzheimer's, multiple sclerosis, amyotropic lateral sclerosis, rheumatoid arthritis, inflammatory bowel disease, and all other diseases whose pathogenesis is believed to involve excessive production of either nitric oxide (NO) or prostaglandins, such as acetyl-L-camitine, octacosanol, evening primrose oil, vitamin B6, tyrosine, phenylalanine, vitamin C, L-dopa, or a combination of several antioxidants may be used in conjunction with the triterpenoid derivatives of the current invention. Dinitrile 1 was synthesized from CDDO by the method as shown in Scheme 1. Oxalyl chloride gave acyl chloride 19 in quantitative yield. 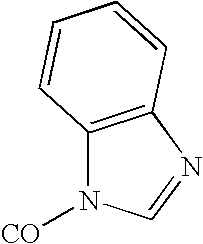 Amide 3 was prepared in 91% yield from 19 with ammonia gas in benzene. Dehydration of 3 with thionyl chloride gave 1 in 89% yield (Drefahl and Huneck, 1958). 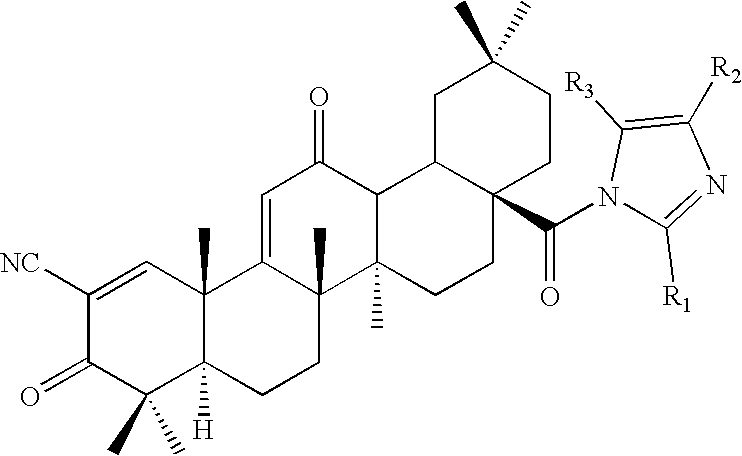 Ester 5 was synthesized in 83% yield from CDDO by a nucleophilic substitution method using an alkyl halide and DBU in toluene (reflux) (Ono et al., 1978) (Method A) Amides including imidazolides were synthesized in good yield by condensation reactions (Method B, scheme 1) between acyl chloride 19 and the corresponding amines and imidazoles. 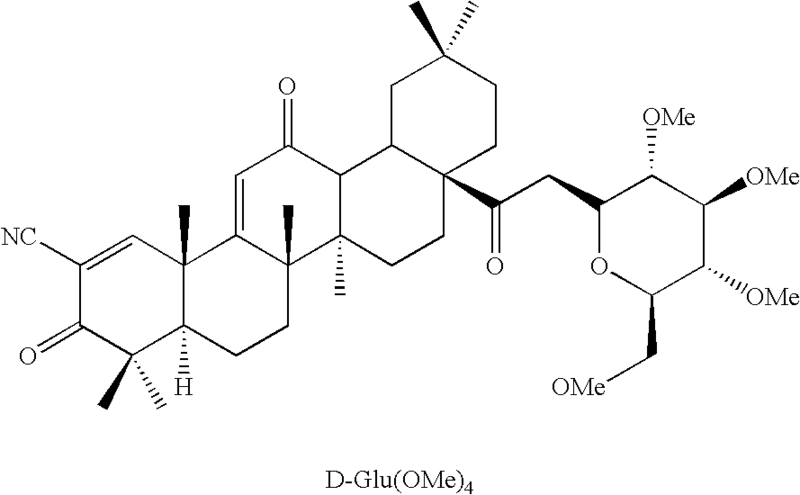 Tetra-O-acetyl-β-D-glucopyranoside 2 was prepared in 75% yield from tetra-O-acetyl-α-D-glucopyranoside bromide (Lemieux, 1963) and CDDO using a phase-transfer catalyst (Bliard et al., 1994) (Scheme 2) (Method C). Because in the  1H-NMR spectrum (300 MHz, CDCl3) of 2 the anomeric proton was observed at δ5.70 ppm (1H, d, J=7.8 Hz) the proton was assigned the β-configuration. 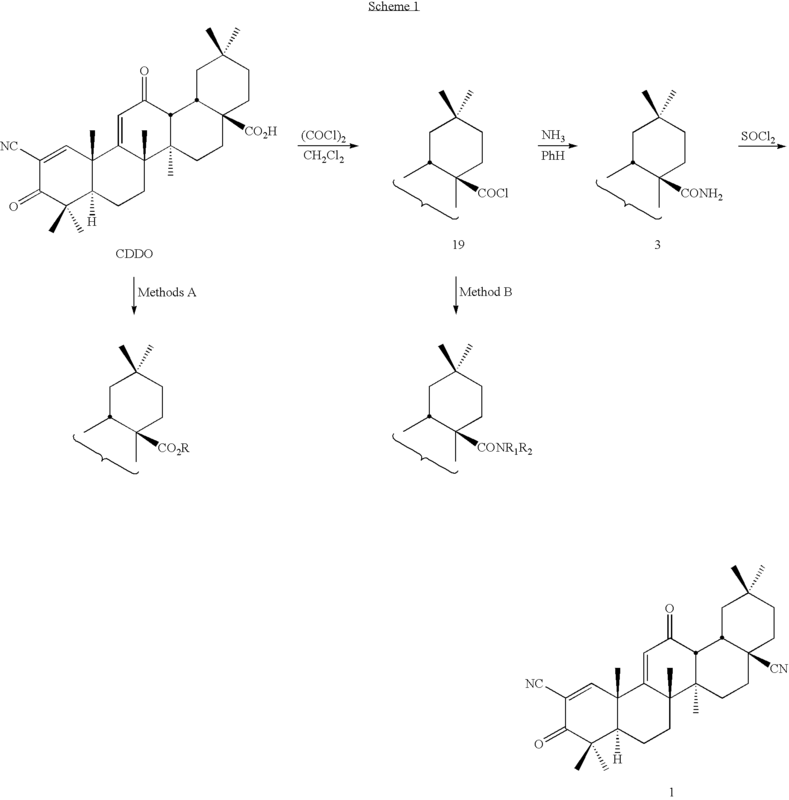 The inhibitory activities [IC 50 (nM) value] of new synthetic triterpenoids 1-15, oleanolic acid, and dexamethasone on NO production induced by INF-γ in mouse macrophages are shown in Tables 1 and 2. 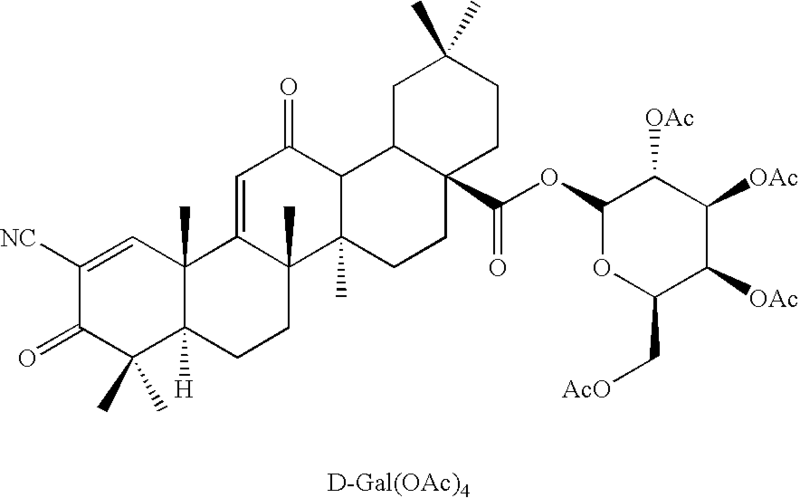 Table 3 describes the potency of three protected glycosides synthesized namely D-Glu(OMe)4,16 L-Ara(OAc)3,17 and D-Gal(OAc)418 Dinitrile 1 and imidazolides 6, 9, and 10 show extremely high potency (IC50 0.01˜3.5 pM); it is about 100-10000 times more potent than CDDO and dexamethasone. The procedure for determining IC 50 on NO production induced by INF-γ in mouse macrophages is as follows. Macrophages were harvested from female mice injected intraperitoneally four days previously with 4% thioglycollate. These cells were seeded in 96-well tissue culture plates and incubated with 4 ng/mL INF-γ in the presence or absence of inhibitory test compounds. After 48 hours NO production, measured as nitrate by the Griess reaction, was determined. This method is described fully by Ding et al. (1990) and Bogdan and Ding, (1992). Ambs et al.,  Nat. Med., 4(12):1371-1376, 1998. Bagasra et al.,  Proc. Natl. Acad. Sci. USA, 92(26):12041-12045, 1995. Bliard, S.,  Tetrahedron Lett., 35:6107-6108, 1994. Bogdon and Ding,  J. Leukoc. Biol., 52(1):119-121, 1992. Boolbol et al.,  Cancer Res., 56(11):2556-2560, 1996. Coyle and Puttfarcken,  Science, 262(5134):689-695, 1993. Culver et al.,  Science, 256(5063):1550-1552, 1992. Ding et al.,  J Immunol., 145(3):940-944, 1990. Drefahl and Huneck,  Chem. Ber., 91:278-281, 1958. DuBois et al.,  Gastroenterology, 110:1259-1262, 1996. Honda et al., Bioorg. Med. Chem. Lett., 7:1623-1628, 1997. Honda et al.,  Bioorg. Med. Chem. Lett., 8:2711-2714, 1998. Honda et al.,  Biorg. Med. Chem. Lett., 9:3429-3434, 1999. Honda et al.,  J. Med. Chem., 43:1866-1877, 2000a. Honda et al.,  J. Med. Chem., 43:4233-4246, 2000b. Huang et al.,  Cancer Res., 54:701-708, 1994. Kawamori et al.,  Cancer Res., 58(3):409-12, 1998. Lemieux,  Methods Carbohydr. Chem., 2:221-222, 1963. Marnett,  Cancer Res., 52(20):5575-5589, 1992. McGeer and McGeer,  Brain Res. Brain Res. 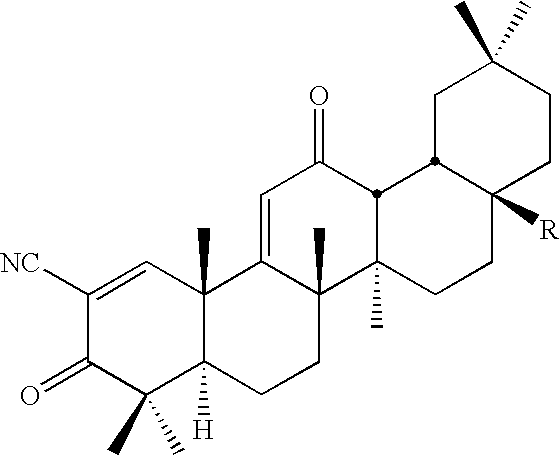 Rev., 21(2):195-218, 1995. McGeer et al.,  Neurology, 47(2):425-432, 1996. Merrill and Beneviste,  Trends Neurosci., 19(8):331-338, 1996. Moncada et ali,  Pharmacol. Rev., 43:109-141, 1991. Nathan and Xie,  Cell, 78:915-918, 1994. Nishino et al.,  Cancer Res., 48:5210-5215, 1988. Ohshima and Bartsch,  Mutat. Res., 305:253-264, 1994. Ono et al.,  Bull. Chem. Soc. Jpn., 51:2401-2404, 1978. Oshima et al.,  Cell, 87:803-809, 1996. Prescott and White,  Cell (Cambridge, Mass. ), 87(5), 783-786, 1996. Reddy et al.,  Cancer Res., 56(20):4566-4569, 1996. Salvemini et al.,  J. Clin. Invest., 93(5):1940-1947, 1994. Salvemini et al.,  Proc. Natl. Acad. Sci. USA, 90(15):7240-7244, 1993. Sheng et al.,  J. Clin. Invest., 99(9):2254-2259, 1997. Siebert and Masferrer,  Receptor, 4(1):17-23, 1994. Simonian and Coyle,  Annu. Rev. Pharmacol. Toxicol., 36:83-106, 1996. Spom and Roberts,  J. Cvlin. Invest., 78:329-332, 1986. Stewart et al.,  Neurology, 48(3):626-632, 1997. Strejan et al.,  Cell Immunol., 84(1):171-184, 1984. Suh et al.,  Cancer Res., 59:336-341, 1999. Takahashi et al.,  Cancer Res., 57:1233-1237, 1997. Tamir and Tannebaum,  Biochim. Biophys. Acta, 1288:F31-F36, 1996. Tsujii and DuBois,  Cell, 83:493-501, 1995. Tsujii et al.,  Cell, 93:705-716, 1998. Vodovotz et al.,  J. Exp. Med., 184(4):1425-1433, 1996. Wang et al.,  Mol. Endocrinol., 14:1550-1556, 2000. Williams et al.,  Clin. Neurosci., 2(3-4):229-245., 1994. 2. The composition of claim 1, wherein R is a substituted or unsubstituted carbonyl imidazole. 3. The composition of claim 1, wherein R is CN. 4. 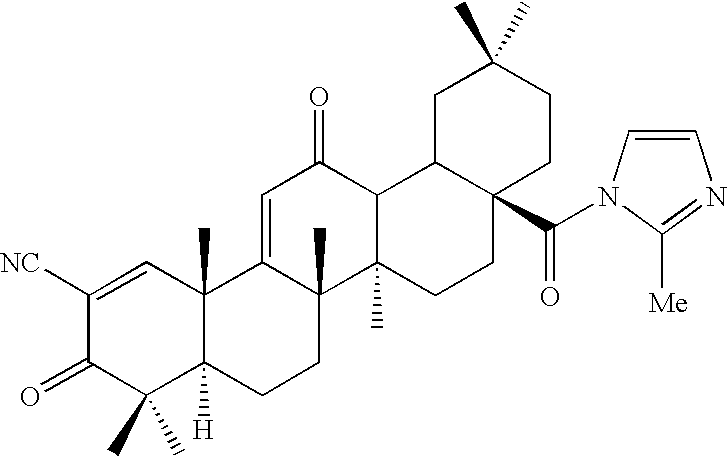 The composition of claim 1, wherein R is CO-D-Glu(OAC)4. 5. The composition of claim 1, wherein R is CONH2. 6. The composition of claim 1, wherein R is CONHNH2 or a pharmaceutically acceptable salt thereof. 19. 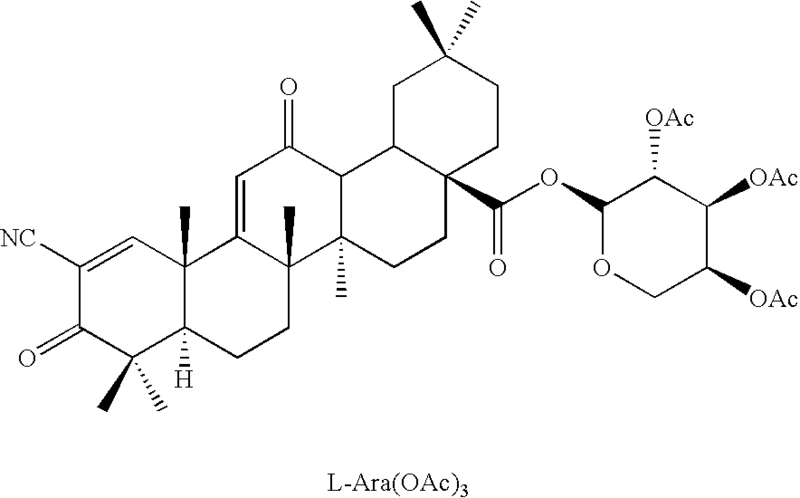 A triterpenoid derivative effective for inhibiting IFN-γ-induced NO production in macrophages or RAW cells, said composition having an IC50 value from 0.00006 nM to 0.43 nM. 20. The composition of claim 19, wherein said composition has an IC50 value from 0.0001 nM to 0.044 nM. 21. The composition of claim 19, wherein said compound is water soluble. 23. The method of claim 22, wherein said patient has cancer. 24. The method of claim 23, wherein said cancer is brain, lung, liver, spleen, kidney, lymph node, small intestine, pancreas, blood cell, bone, colon, stomach, bread, endometrium, prostate, testicle, ovary, central nervous system, skin, head and neck, esophagus, or bone marrow cancer. 25. The method of claim 23, wherein said cancer is epithelial cancer. 26. The method of claim 23, wherein said cancer is lung, colon, breast or prostate cancer. 27. The method of claim 26, wherein said cancer is colon cancer. 28. The method of claim 22, wherein said patient has been identified as having a high risk for the development of cancer. 29. The method of claim 22, wherein said patient has an inflammatory disease. 30. The method of claim 29, wherein said inflammatory disease is rheumatoid arthritis, or inflammatory bowel disease. 31. The method of claim 30, wherein said inflammatory bowel disease is selected from the group consisting of Crohn's disease and ulcerative colitis. 32. The method of claim 22, wherein said patient has a neurodegenerative disease. 33. The method of claim 32, wherein said neurodegenerative disease is Alzheimer's disease, Parkinson's disease, multiple sclerosis or amyotrophic lateral sclerosis. 34. The method of claim 22, wherein said patient has a pathogenesis involving the excessive production of nitric oxide or prostaglandins. 35. The method of claim 22, wherein said compound is administered with an aqueous solution. 36. The method of claim 22, wherein said pharmaceutically effective amount is 0.1-1000 mg/kg. 37. The method of claim 22, wherein an additional therapeutic agent is administered to said subject. 38. The method of claim 22, wherein said subject is a mammal. 39. The method of claim 38, wherein said subject is a human. Kettelhut et al. 1988 Tumor necrosis factor can induce fever in rats without activating protein breakdown in muscle or lipolysis in adipose tissue.